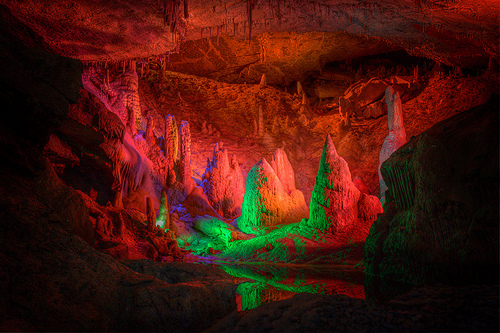 The Forbidden Caverns, an attraction located in Sevierville, Tennessee, a short drive from Gatlinburg and Pigeon Forge, is a one-hour walking tour that guides you through rock formations, a clear stream, grottos, and towering chimneys, to name a few. Used as shelters by the Indians in the past during their hunting trips and as a water source, the Forbidden Caverns officially opened to the public in 1967. How much do the Forbidden Caverns cost? To visit the Forbidden Caverns, the costs for children 5-12 are $10 each, whereas visitors older than 12 pay $16 each. Any child under the age of five can visit for free, according to VisitMySmokies.com. These prices, however, can be much less if you look for readily available coupons online. For example, you can print a $1 off coupon via the VisitMySmokies.com we mentioned earlier. A quick search online can often yield additional coupons as well, but for the most part, the only coupons we could find seemed to be the $1 off admission coupons. The Caverns are open from April through November, every day, with the exception of Sunday, from 10 a.m. until 6 p.m. Tours will take place every 15 to 25 minutes, with the last tour leaving at 5 p.m.
During the tour, typically lasting about one hour, tour guides put on a small light show and explain the history of the caverns, ranging from the Indian era to the early 1920s when moonshiners would use the area as a place to hide to make their moonshine. Handrails and lighting have been added of late, and the tour is recommended for those of all ages. Tennesse is home to the most caves in the entire United States, with more than 8,350 registered as of today. The caverns, regardless of the time of the year, will always be 58 degrees, meaning it’s generally comfortable; however, visitors are encouraged to bring a light jacket in case you feel the temperatures are too cold. Also, since water is present in some areas, visitors are also encouraged to wear comfortable shoes, preferably hiking shoes due to the walking involved. Visitors recommend staying near the back of the group if you want to take pictures so you do not hold up the line.